Tests on leading brands of bottled water turned up a variety of contaminants, including cancer-linked chemicals three times higher than California's health standard, according to a study released Wednesday by an environmental advocacy group. The findings challenge the popular impression — and marketing pitch — that bottled water is purer than tap water, the researchers say. However, all the brands met federal health standards for drinking water. And most of the detected contaminants are common in tap water, too. 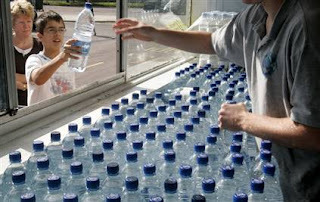 Lab tests detected 38 chemicals in 10 brands, with an average of eight contaminants found in each kind of bottled water. Tests showed coliform bacteria, caffeine, the pain reliever acetaminophen, fertilizer, solvents, plastic-making chemicals and the radioactive element strontium. The two-year study was done by the Washington-based Environmental Working Group, an organization founded by scientists that advocates stricter regulation. It bought bottled water in California, North Carolina, Virginia, Maryland and Delaware. In the Wal-Mart and Giant Food bottled water, the highest concentration of chlorine byproducts, known as trihalomethanes, was over 35 parts per billion. California requires 10 parts per billion or less, and the industry's International Bottled Water Association makes 10 its voluntary guideline. The federal limit is 80. Water researcher Dr. David Carpenter, director of the Institute for Health and the Environment of the University at Albany, who had no role in the study, singled out trihalomethanes as the biggest concern because of strong research links to cancer. "These are levels that should not be in bottled water," he said. Giant Food officials declined to comment. Instead, company officials released a brief statement asserting that Acadia meets all regulatory standards. Acadia is sold in the mid-Atlantic states, so it isn't held to California's standard. In most places, bottled water must meet roughly the same federal standards as tap water. The researchers also said the Wal-Mart brand exceeded California's limit by five times for a second chlorine byproduct, bromodichloromethane. The Environmental Working Group said it notified California's attorney general of its intent to sue Wal-Mart. The group wants the company to label its bottles in California with a warning of cancer-causing chemicals. Wal-Mart did not respond to a request for comment. Joe Doss, president of the International Bottled Water Association, said he would not defend any company that is exceeding the standard in California. "If they have exceeded it, they should meet it," he said. The chlorine byproducts, which studies have also linked to birth defects, presumably come from chlorine used as a disinfectant, which ends up in public water systems. Tap water is often repackaged and sold as bottled water, and the researchers say that was true of these two brands. "In some cases, it appears bottled water is no less polluted than tap water and, at 1,900 times the cost, consumers should expect better," said Jane Houlihan, an environmental engineer who co-authored the study.